Grey Group Malaysia and Telekom Malaysia are turning the everyday simple umbrella into an active warrior against Dengue. 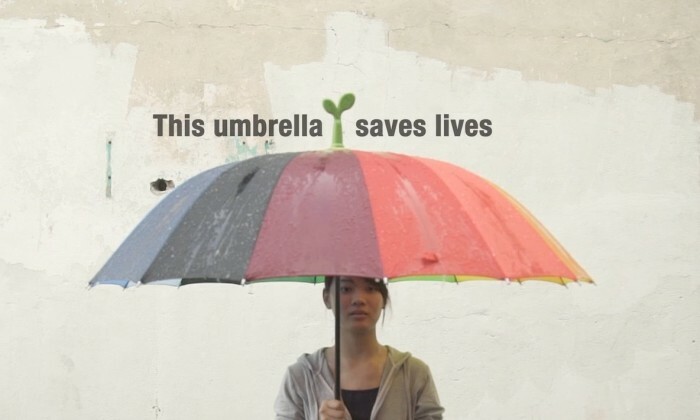 The RainSprout fixed on top of an umbrella uses rainfall to distribute larvicide into the very puddles where mosquitos can breed. RainSprouts were distributed for free this April into areas across central Malaysia (Kuala Lumpur, Petaling Jaya) where a dengue outbreak had recently occurred. Championed by Grey, the RainSprout project will be listed on the new webe community platform in June for it to be unlocked by the community for even greater mass distribution. Grey client, Telekom Malaysia’s new digital mobility service provider, webe, launched its webe community platform www.webe.com.my in April. The platform hosts a variety of projects for the Malaysian community that the public can vote to make happen in the community. The RainSprout works via a replicable patch at the base which is impregnated with a non-toxic larvicide. When rain hits the patch, it mixes with the larvicide and runs off the umbrella into the puddles. Harmless to all other living organisms, the larvicide starves the mosquito larvae before they can develop. In her new role, Clyne will be responsible for driving advertising and sponsorship revenues across multiple portfolios in the APAC..